Notes: Leiji Matsumoto halted the production of the TV series, with the power of his philosophy, and the delays caused this show to be turned into an OAV release. Being a man of strong principle, he took action immediately after noticing that one of the enemy ships was modeled after the Star of David. He didn't allow this to go through mainly since it would be demeaning someone else's belief. This would be hypocritical of the characters and his principles considering that the series revolves around man being given the right to believe in what he wants to and how he should stand by those beliefs. In other news, Leiji Matsumoto is the most badass person ever. And for the sake of consistency, I too will also use the "Harlock" spelling as opposed to the "Herlock" spelling. Interestingly enough, this has been my only real exposure to the series. The antiquated nature of the show is something you don't really see a whole lot of. So what happened is that Rintaro (with the help of his usual production studio, MADHOUSE) decided to take the series and revive it once more to show the younger generation what being a real man is all about. We follow that path to becoming a real man in the shoes of a young boy, Daiba Tadashi (symbolizing the younger, more feeble-minded generation), whose father was murdered at the beginning of the series. 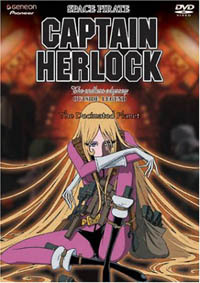 He regrets being on bad terms with him before he died and decides to journey off into space with Harlock (symbolizing the older, more wiser generation) and The Arcadia in order to avenge his father's death and to investigate the disappearance of the Earth at the hands of the ancient ruler(s) of the universe, the Noo. The path of a real man in pursuit of his ambition is an arduous journey littered with many obstacles, but Harlock is the kind of manly man who will brave the tide of hardship and walk over it as if it were nothing. But even with that exterior appearance, it is made clear in the series that there exists no man that is without fear. The only kind of "fearless" men that exist are those who do not give into the fear buried deep within their hearts. Harlock is THAT kind of man. He walks over whatever is in his way, barely giving it a passing glance, not without fear, but with determination. While Daiba isn't exactly one of those men, he strives hard to tread the path his father wanted him to. For one thing, the basic foundation of being a man is learning how to keep a promise. When he chose to take that solemn vow with Harlock to avenge his father, he made a promise that he must fulfill. To give up halfway or to casually change your mind without just cause is not an option as it debases the code of honor among space pirates. This and many other invaluable teachings are to be learned in the series. But ultimately, the most important lesson bestowed upon us will be that: while a man may know how to keep a promise, a real man will also come to know how to forgive. Harlock teaches us all this as he literally tramples over the many things that stand in his way. Not necessarily challenging his enemies, but those who dare oppose his ironclad principles. So it's not him who is invincible as it is his ideology, from which he draws his seemingly infinite will. It's nice to know that men of this admirable stature still exist. Nowadays, most people seem to be more concerned with making their heroes or lead characters seem more "human", leaving less admirable men and more angst-ridden boys. This series, when you put it up against everything, is like having the real difference between boys and the men that stand amongst them defined. Feel free to use it as a gauge, Boy.